Agnia Grigas is an energy and political risk expert based in Washington, DC. She is also the author of Beyond Crimea: the New Russian Empire, a book that demonstrates how Russia, under both Vladimir Putin and Boris Yeltsin, has pursued policies of deliberately undermining and destabilising the former Soviet states – not only the Baltics and Ukraine but also countries such Moldova and Georgia, and even at points allies like Belarus and Armenia. This has varied from “passportization” (handing out Russian passports to those who live beyond its borders), encouraging separatist activities and promoting campaigns of disinformation. She also tracks how the official government definition of Russian “compatriots”, often vague and fluid, has changed multiple times over the years, ranging from those who identify with Russian culture and the Russian language to, at its greatest extent, anyone of any nationality who once lived under the Soviet Union, as well as any of their descendants who live outside their so-called “titular” states. Grigas was born in the city of Kaunas, Lithuania, at that time under Soviet occupation, before immigrating to the US with her mother at the age of ten. She is the author of two other books: The Politics of Memory and Energy Between the Baltic States and Russia, and the just-issued The New Geopolitics of Natural Gas. Deep Baltic’s Will Mawhood recently had a chat with her via email about Beyond Crimea, her other work and what the Baltic states can expect from their eastern neighbour over the coming years. Although “the new Russian empire” might imply territorial advances, rather than full-scale invasions, Russia mostly pursues what you call “low-risk, high-return” strategy of creating frozen conflicts which seriously undermine their host countries without requiring Russia itself to take responsibility for their administration – seen in Transnistria [in Moldova], South Ossetia, Abkhazia [in Georgia]. In this sense, Crimea is very much an outlier. Do you feel there is the risk of further full-scale interventions, in the Baltics or elsewhere – or will Russia be likely to stick to this strategy? The leadership in the Kremlin has been and will continue to be opportunistic. The annexation of Crimea was facilitated by unique circumstances of regime change in Kyiv, the heavy Russian military presence on the peninsula, and years of laying the groundwork by Moscow for such a move, that all together enabled Russia to take advantage of this opportunity and occupy the territory. There are always risks of Russia escalating its model in the Baltics or elsewhere if opportunities present themselves. Meanwhile it is in the cards that South Ossetia and Abkhazia will be formally incorporated into Russia – a process that is already in the works. You comment at one point that “unlike the more authoritarian Central Asian states, the open and democratic Baltic governments have had less capacity to counter many Russian policies”. Is there any way that the Baltic states could change this without losing their “open, democratic” status? The Baltic governments certainly have the capacity to counter Russia’s efforts to co-opt Russian speakers or Moscow’s information and hybrid warfare campaigns but this requires more effort. Authoritarian states can simply forbid organizations of Russian speakers, close down questionable media channels, and arrest pro-Moscow activists; the Baltic States will have to build consensus in their societies and work on integrating any minorities through open and democratic means. Moreover this dilemma is faced not only by the Baltic States, but by all democratic and free-media societies that now must engage the propaganda campaign waged Russia’s state-owned and state-sponsored media that has become an instrument of war. In most of the countries covered in your book, the majority of Russian-speaking minorities are Soviet-era immigrants or their descendants – certainly the case in the Baltic republics. How far did you feel that this something that was done deliberately – as ways of undermining and weakening the “titular nations” of the Soviet republics? It’s certainly deliberate to a degree. Moscow has long relied on ethnic politics to achieve their aims of weakening and destabilizing their neighbours or newly conquered territories. Efforts to Russify, colonize, or create ethnic tensions go back to Tsarist and Stalinist policies and have persisted throughout the Soviet and post-Soviet years. How far has there been genuine concern from the Putin administration and previous Russian governments for the situation of ethnic Russians and Russian-speakers, and how far is it purely cynical? You mention that by contrast to the sustained and negative focus on the Baltic states from the Russian media, countries such as Turkmenistan and Kazakhstan, where Russians have unambiguously been the subject of discrimination, are very rarely covered. Moscow’s policies towards its so-called compatriots were highly cynical and largely driven by self-interest. While certainly some in the Russian government or public are genuinely concerned for Russian speakers abroad and want to provide them with cultural support, for the most part these compatriots have been used by the Kremlin as instruments of foreign policy, domestic politicking, propaganda, and ambition. Very little has actually been done for the Russian speakers – especially in regions such as Central Asia where they actually have and do face more difficulties. Instead as Russia had sought to do gas deals with countries like Turkmenistan they stayed silent about the civil liberties of Russian speakers there. Putin’s Russia is trying to formulate an alternative ideology and worldview to counter that of the West. Part of this ideology is the appeal to traditional values and the Orthodox Church. Politically, they are trying to bring into their fold conservatives, not only in the Baltic States, but across Europe and even the United States. This is not a new strategy. Lenin and early Marxists believed that the political far-left and the far-right could be unified and decimate the political centre to ensure a victory for the communists. Today we also see Russia support far-right and populist political parties and leaders across Europe. You’ve stated (here) that while Donald Trump may try to improve relations with Russia, he will likely find it impossible, in the same way that Obama and Bush had problems. What are the main reasons for this? There are simply too many conflicts of interests and too wide a gap in their worldviews. Simply put, today, the US is the leader of the global order while Russia is the main challenger to this order. While Washington and Moscow may come together and work for brief periods on some isolated issues, at the end of the day their differences will outnumber their common interests. Likewise, Moscow views the world in zero-sum terms and it will perceive any gain by the US as an immediate loss for Russia. This makes cooperation difficult long-term. What is an acceptable level of engagement from Russia in the affairs of its neighbours? Can any kind of privileged position be justified, given the sizeable numbers of people in these countries who identify to some extent with it, and who in at least some cases may not be treated especially well? Most countries pursue diplomacy and soft power initiatives vis-à-vis their neighbours and such engagement efforts from Russia would be acceptable. However, a ‘privileged’ position cannot be justified and it will never be acceptable to most of its neighbours, especially in the Baltic States. However, in reality, Russia is not seeking engagement or diplomacy in its neighbourhood. It is pursuing a hybrid warfare operation. You’re rather critical regarding Estonia and Latvia’s decision not to provide automatic citizenship to Soviet citizens who entered the countries while they were under occupation, and indicate that this has hindered the process of integration. But would not a different policy have been likely to strengthen Russia’s sway in these countries, and potentially endanger their stated aim of reorientation to the West and return to their historic geopolitical positions, given Russian-speakers’ tendency to vote as a bloc in these countries and frequent desire for close ties with Russia? I would not say that I’m outright critical of Estonia and Latvia’s decision not to provide automatic citizenship and understand some of the reasons motivating such a decision. These countries faced a double-edged sword – provide automatic citizenship to everyone and perhaps be voted out of independence, or EU or NATO integration in the early years of their statehood. At the same time, not providing automatic citizenship, especially for the younger generation, they hindered integration of Russian speakers and provided a pretext for Moscow’s criticism and meddling. Nonetheless it is important to realize that even though Lithuania provided universal automatic citizenship to its inhabitants, that did not prevent Moscow from trying to pursue similar compatriot policies there. However, I do believe that all three Baltic countries (not just Latvia and Estonia) could have been more thoughtful and done more about their integration policies in the 1990s and 2000s, and realized that this will be a weakness that Moscow will try to continuously exploit. You discuss the concept of “compatriots”, which has become increasingly important in Russian foreign policy over the last 25 years, but has often been highly ambiguous – at points, as you mention, it was sufficiently broadly defined to include anyone who was born in the Soviet Union regardless of their nationality, as well as any people of Russian descent anywhere. The tables attached showing the changes in wording and policy direction since 1991 cover several pages. Is it likely we are going to see still further changes in its definition in the years to come? Moscow’s definition of compatriots and its policy vis-à-vis citizenship continues to evolve. Interestingly, there are now discussions to expand the right to Russian citizenship to anyone whose ancestors resided in the territory of the former Russian empire. At the same time there is a simultaneous movement to constrain existing Russian citizens, who must now report if they have acquired a second citizenship and effectively choose either one or the other. You demonstrate in the book how Russia’s policy of “passportisation” – essentially handing out passports to the residents of the separatist areas of Georgia – gave it an excuse for intervening militarily when [then-Georgian president Mikheil] Saakashvili attempted to reassert control. Latvia is the only Baltic country to allow dual citizenship – and only from a select number of countries, which doesn’t include Russia – but Latvia and Estonia both have large numbers of Russian citizens, largely due to their policy of issuing citizenship only to those who could prove family links with the pre-war republics. Does this make them unusually vulnerable to this kind of approach from Russia? Absolutely. ‘Passportization’ is one of Moscow’s most dangerous policies as essentially an offer of a passport is an offer of the Kremlin’s protection. This is particularly concerning where Russia is seeking systemic passportization in Estonia’s and Latvia’s territories that border the Russian Federation. One needs to only look to Georgia and Ukraine to see how that played out. As you demonstrate, Russia has alternated between covertly trying to prevent “compatriots” in post-Soviet republics from leaving (as in the early ‘90s, when the country was hardly in a state to deal with tens of millions of people coming in), and trying to encourage at least some of them to move to Russia, as in the late 2000s, which had very limited success – in the Baltic states, at least. What do you see being the most likely approach going forwards? Moscow’s campaign to return compatriots to Moscow was more a PR stunt than a real effort. By the late 2000s, most Russian speakers of the post-Soviet space had either emigrated or integrated. Moreover, the Kremlin’s offer that these compatriots move to Russia’s Gulag territories – in the remote corners of Siberia and the Far East – could have hardly been appealing either. I anticipate that policies remain similarly mixed with domestic political motives and foreign policy ambitions. Much of your other work has been about the effect on geopolitics of energy supplies. You’ve recently commented that “in the near term, Moscow’s political influence will erode as the Russian gas giant Gazprom loses share in its traditional markets while its efforts to pivot eastward to meet China’s voracious energy needs will largely depend on Beijing’s terms.” Does this likely waning of Russia’s influence in this field mean its smaller neighbours will be safer, or is it likely to simply add to its desire to assert itself? As I discuss in my newest book, The New Geopolitics of Natural Gas (Harvard 2017), one of Russia’s key sources of power and influence – its position in the global energy markets – is on the wane as the United States has now emerged as the world’s leading producer of oil, natural, and refined petroleum products, and is an emerging LNG exporter. Russia’s declining source of revenue as well as status and influence will result in several developments. First, Russia’s smaller neighbors will have greater opportunities for energy security and the tentacles of Kremlin’s energy interests will be constrained. At the same time as Russia is more constrained it is more likely to get aggressive abroad and repressive at home in the last showdown as leadership in the Kremlin tries to hold on to power. 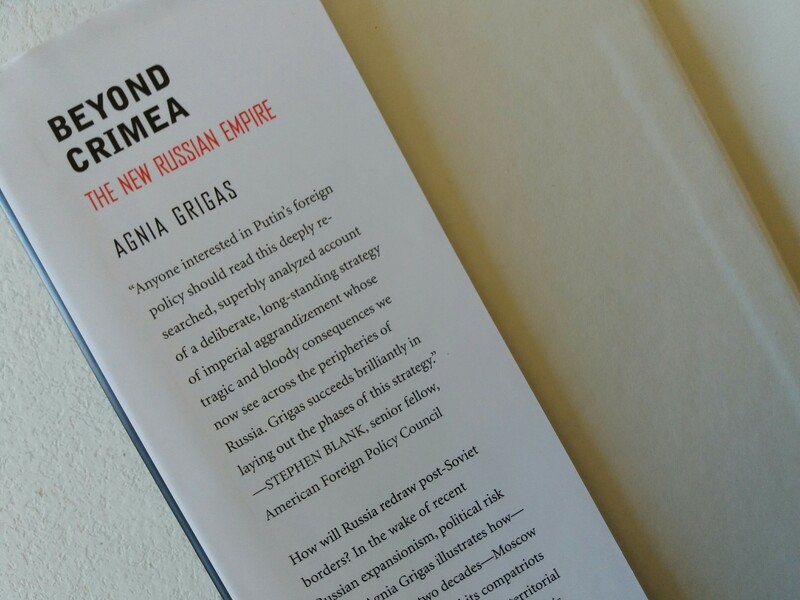 Beyond Crimea is published by Yale University Press and available here. You can find out more about Agnia Grigas’s other work at her website.